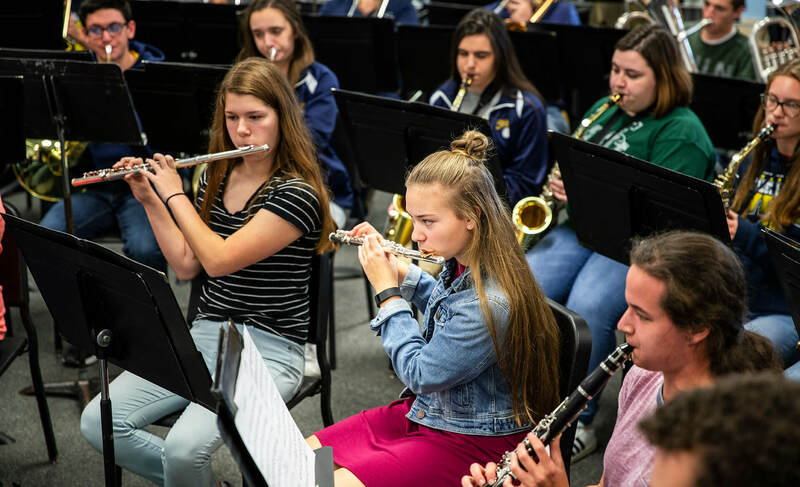 Valley Lutheran High School’s instrumental music groups all perform with the same goal in mind: to bring honor, glory, and praise to our Lord, Jesus Christ. The focus of our instrumental music curriculum is to continue the development of both the technical and expressive aspects of performing on an instrument, both as a soloist and an ensemble member. Repertoire is catered to the unique abilities of each ensemble from year to year, with a focus on excellence in performance. Musicians have various opportunities for performances, including concerts, athletic events,festivals, small ensembles, and our annual Lenten Tour. Leaders are intentionally developed within our department and students are encouraged to take ownership of their ensembles. Symphonic Band is Valley Lutheran’s premier instrumental ensemble, open students in 9-12 grade by audition. Repertoire is selected from traditional wind band music and contemporary symphonic band settings, ranging from advanced high school to collegiate level music. In the spring, along with the Golden Voice Choir, it tours the Midwest, bringing the message of Christ crucified to thousands each year. The Symphonic Band is also Valley’s Pep Band, performing at football and basketball games throughout the year. Symphonic Band has developed a reputation of excellence and has earned many top accolades in recent years. However, the goal of the group is always to bring glory to Christ through every rehearsal, practice time, and performance. Wind Ensemble serves as a transition from grade school band to high school band. Students at all grade levels may be a part of this group, with no audition required. The goal is to build upon the basics the students have mastered and to introduce them to high school level music. Students are also exposed to music theory and history. The Junior Symphonic Band Program serves seven of our association grade schools with beginning, intermediate, and advanced band instruction twice weekly. Students in grades 5-8 are taught in small-group settings and combined to perform two concerts a year as a large ensemble. Students also have the opportunity to participate in their area Lutheran Music Festival each spring. Percussion Ensemble is geared towards percussion and non-percussion students who have a passion for using their gifts after school as well as in our performing ensembles. Their music focuses on complex rhythmic patterns and non-traditional instrumentations. Jazz Band introduces students to new types of music and the skill of improvisation. Music is selected from a wide variety of styles including rock, Latin, blues, swing, and big band. Jazz band plays for concerts and special functions, such as the VLHS Dinner Auction. Brass Ensemble is open to all brass players in Symphonic Band and Wind Ensemble. Music is catered to individual events, such as the Choral Christmas Concert, the annual Good Friday service, and other worship and community opportunities. From time to time, various groups of students express interested in forming choirs of instrument families, such as Flute Choir or Trombone Choir. These groups are largely student-led, and repertoire is dictated by their unique interests and performance opportunities.